This decal set covers British Anti-Flash white pale red and pale blue roundels and codes. 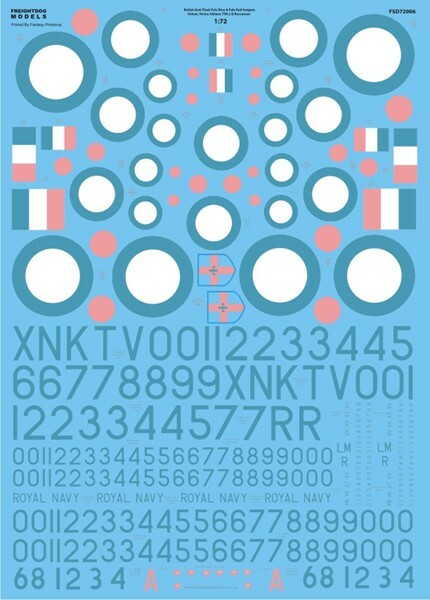 The double A5 sheet includes one set of roundels for each V-Bomber, TSR2, NA39 or Buccaneer S1/S2 with all applicable serials in 1/72nd scale. Bonus decals included are 700Z NAS freestyle font numbers carried by NA39’s, Waddington flight Vulcan B.1A Lincoln shield and Victor B.1 of A sqn 232OCU pink tail code. This sheet has been reprinted by Fantasy Printshop and is limited to 200 sets only. Ideal for the new Airfix Valiant kit.